A casino dealer is the one responsible for serving players at a land based casino. He is the one who gives cards, explains game rules and handles bets and payouts. They are also called croupier. This job entails training in order to be professional. It can be profitable job especially for the experienced dealers who do the job efficiently. Training varies from one country to another but typically, easy games to play are the ones which are taught before the more complicated. In the US and Australia casino dealers are required to get a gambling license. They are checked if they have any police record and any bad credit rating. Unlike licensed dealers, they are not allowed to deal at the casino. A casino dealer benefits from tips given by customers. But each dealer must not be biased with any of the players, and thus, he/she must be careful in showing kindness to any of them in order not to be accused of favoring one or two players. They must be fair enough to show equal kindness to everyone. In a casino, tips are typically pooled together and divided among all dealers. There are players who give tips the dealer in order to set his/her good mood. In Australia dealers are not permitted to take tips in order to avoid prejudices and misunderstandings. Casino dealer may have a lucrative income if he/she is an expert at his field. He/she must be fast, sharp and sociable. People who want to be casino dealers visit trainings on casino dealing. Duration of these trainings varies on the game which is studied. Once he/she have learned the skills, it is necessary to pass the audition to work at the casino. But not everyone has the qualities which are necessary to become a casino dealer. Pleasant personality is certainly needed for a casino dealer to be successful. He/she must have a positive attitude since the main activity is to work with people. He/she must always be willing to offer assistance to any customers who are in need of his/her help. Swiftness and sharpness can be acquired with practice and experience, but the right attitude can lead the dealer to a more lasting career since it shows that dealers usually enjoy their job. Want to Be a Dealer - Work Hard! Dealing may seem to be a very interesting job but it actually entails a lot of hard work. Casino dealers have to endure working late at night and at a smoking area. This can expose them to some health hazards and thus they should observe a healthy lifestyle and get plenty of rest. Casino dealers should arrive earlier at the casino before their scheduled work, in order to be briefed about any information that takes place in the gambling establishment. 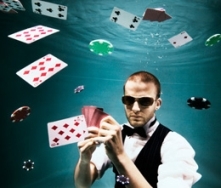 A good casino dealer is admirable for the ability to be very sharp with all the cards, bets, chips and cash. It may not be an easy job, but it is quite suiting for those who love casino games. It is also ideal for those who enjoy the company of different people.